MISSION ESL COMPUTER LAB: Jackson Pollock: A Revolution in American Art, from Voice of America. Jackson Pollock: A Revolution in American Art, from Voice of America. Jackson Pollock helped create a new art movement known as Abstract Expressionism. 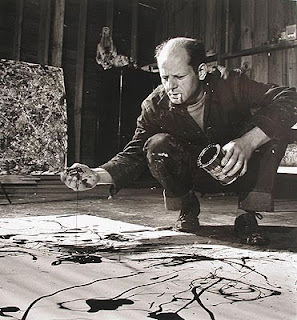 'In nineteen forty-four, Pollock married Lee Krasner who was also a skilled Abstract Expressionist painter. The next year they moved to East Hampton, a small town on Long Island in the state of New York. The couple wanted to get away from the busy life of New York City. In this country environment they could enjoy nature and have more time to work on their art. The home in East Hampton, New York where Jackson Pollock lived with his wife Lee Krasner is now a museum. At this special place you can see the rooms where these artists lived. Most importantly, you can see the studio where Pollock and Krasner created their work. On the floor of the studio is the evidence of years and years of Pollock’s thrown paint. 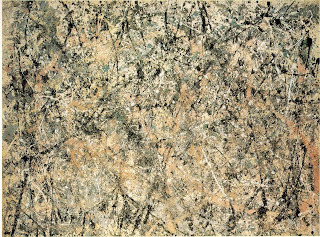 The floor looks just like one of Pollock’s paintings. 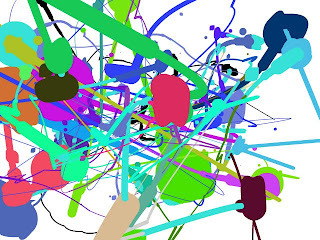 Jackson Pollock in Wikipedia You can probably find a translation of this article in your language. The list of languages is on the left side of the page. But please use these translations sparingly. If you can already understand most of the English, continue reading in English, and use the translation only to check your comprehension. Jackson Pollock Gallery. click on the right facing red arrow to browse Pollock's paintings. 1. 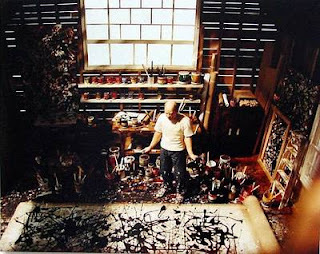 Jackson Pollock pioneered a new approach to __________ Expressionism. c. The Spanish Painter, Miro. 4. The painting called "Lavender Mist" has __________ colors. 6. __________ critics of Jackson Pollock's "drip" paintings thought they were wonderful and fresh. d. Only one of them. a. in a car crash. d. in a duel with a realist. a. 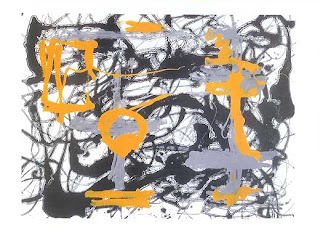 "The Best American Abstract Expressionist". b. "How to Make a Total Mess of Your Living Room". c. "Painting According to Time Tested Traditions". d. "Landscapes and How They Sometimes Trick You". a. a crazy guy who threw paint at canvases. b. an innovative abstract painter. c. a depressed and useless alcoholic. d. a cautionary tale about driving carelessly.